I designed my pond garden to take advantage of both the sunrise and sunset lights cast by the sun. I harnessed the sun's glow on the plants as a "natural spotlight" and back light to bring out the glistening plumes of ornamental grasses and to reveal the inner hues of my strappy Phormiums. A dramatic and radiant garden, ready for it's close-up when I awake and when I bid the day goodbye! 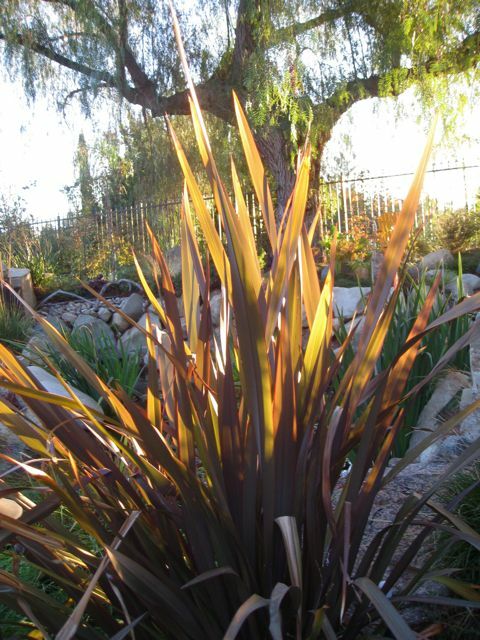 The sun reveals honey-colored hues within the dark, purple leaves of the Phormium. 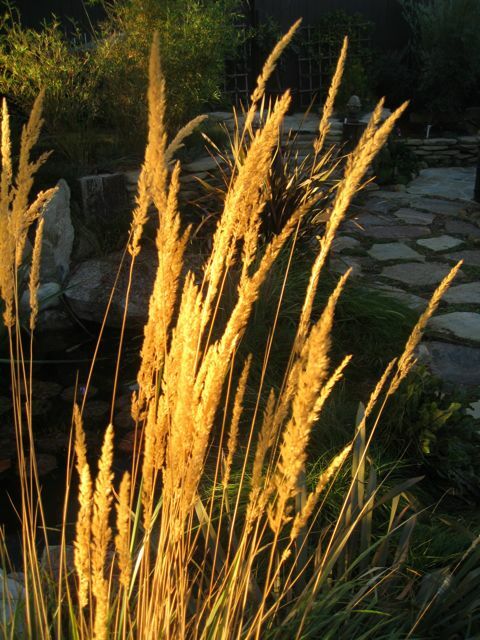 The ornamental grass, Calamagrostis glows behind it. The long-lasting plumes of the Calamagrostis have been performing since summer in my zone 10 garden! When the Japanese Maple tree is backlit, you can see it's "true colors." The Calla lily reveals different shades of green. A closer look at my Phormium. Calamagrostis at sun down. What a wonderful way to say "good night!" 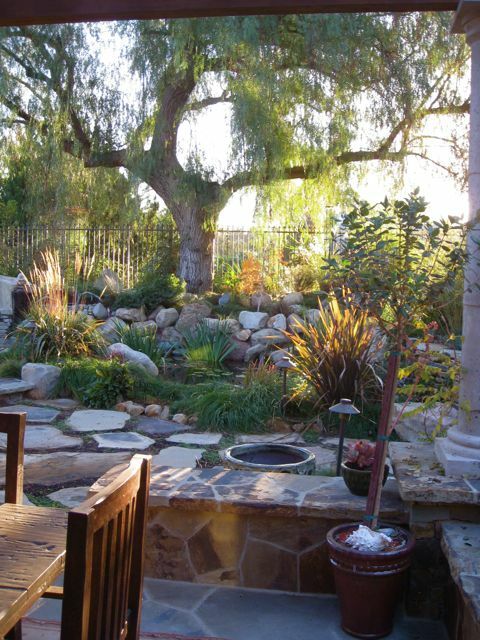 Don't rush to create your garden until you have spent lots of time in the yard, studying the sun and shadow patterns. 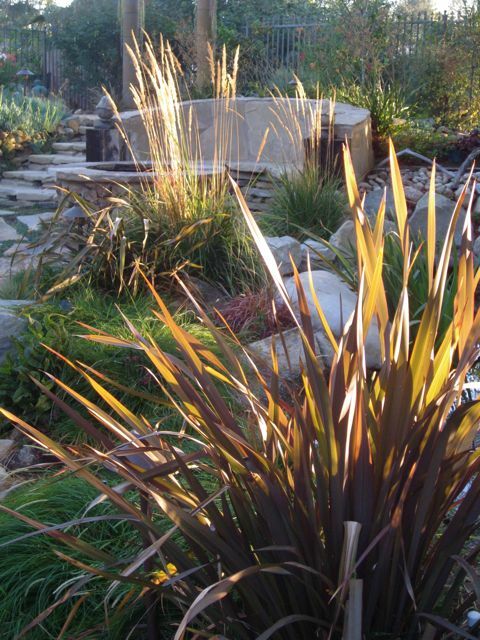 Use the natural light to bring out the "hidden" beauty of your plants and add some drama to the garden! What a handsome perfectly weighted iron fence to frame without overpowering the view. What happens to Japenese maples in California. We have winter when the leaves fall off the trees and you pray it didn’t forever kill your maple. Our big maples like a Silver will be just fine. I guess I’m asking what happens to all deciduous trees? I honestly never thought about till seeing yours. Now that Pepper tree is so commanding. No arguing with him that he stands loud and proud. I like coming to your blog best when you are talking about your garden. I like how appreciative you are of every texture, angle, color, shape, size, style, location, feeling, smell, taste, and every other thing a person needs for comfort and joy. 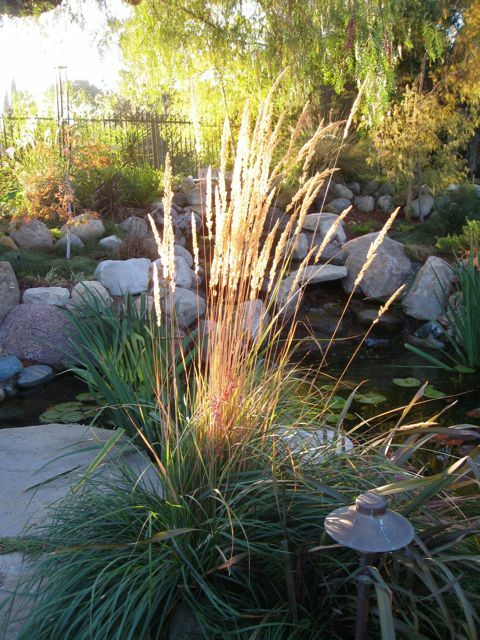 I love the play of light on all your grasses, plants, rocks, water. Seems like it would extend the daylight hours too. All that glow and reflection helps the sunrays dance till midnight. I love it all and wish I was looking out my back porch at it. Thanks for the visit and comments. Hope you are all well. Back-lighting is so evocative, Shirley. I could just move into your garden and never leave! Wonderful post – reminding people that the sun is an important design element (you can only imagine HOW IMPORTANT it is for Seattle gardeners! when the sun finally comes out, people are thrilled). Beautiful setting, Shirley! Many of our grasses have been flattened by ice and snow. 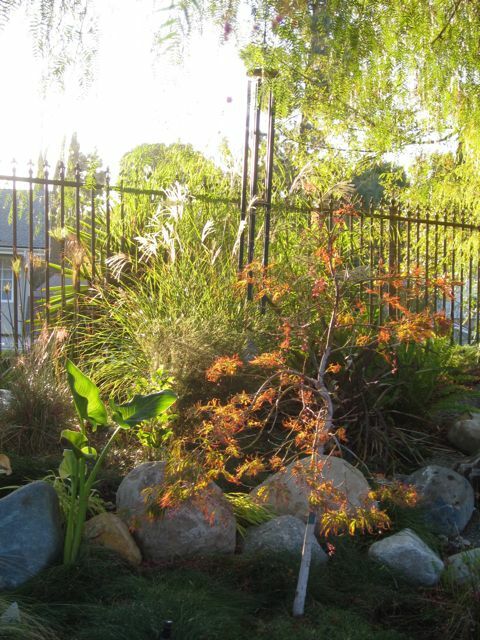 Your garden really is in tune with that glorious golden southern California light. I love that old pepper tree, too! What a little oasis. a true eden. Just lovely! You did a great job in planning out this garden. It is lovely.